From winning state championships to three-time All-America selections at Duke University, Ibtihaj was poised for success, but the fencing community wasn't ready to welcome her with open arms just yet. As the only woman of color and the only religious minority on Team USA's saber fencing squad, Ibtihaj had to chart her own path to success and Olympic glory. Proud is a moving coming-of-age story from one of the nation's most influential athletes and illustrates how she rose above it all. IBTIHAJ MUHAMMAD is a fencer and the first Muslim American woman in hijab to compete for the United States in the Olympic Games. 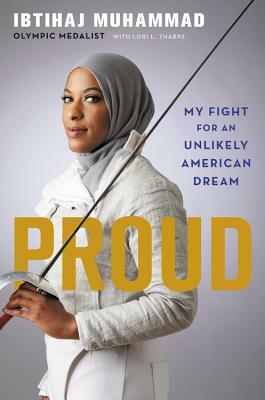 She is also the first female Muslim American to medal at the Olympic Games, winning bronze in the women's saber team event. Named one of TIME magazine's 100 Most Influential People In the World, she serves as a sports ambassador for the U.S. State Department, cofounded Athletes for Impact and the clothing company Louella, and inspired the first hijabi Barbie in her likeness. LORI L. THARPS is the author of Same Family, Different Colors, among other books. Her writing has also appeared in the New York Times, Washington Post, Glamour, and Essence. "Fencing made her who she is today, but fencing isn't her only narrative. Her journey is one of authenticity at all costs and being unapologetically herself." "A powerful sentiment that sums up not only her own struggles, but those of so many minorities in America." "It's clear that Muhammad has become an icon beyond the realm of sports.... Ibtihaj Muhammad's journey is uniquely her own, and yet, it is one that many people will find relatable, comforting, and inspiring."